Al - no glovebox on elise/exige. Having come from an Elise i don't know what to do with my Evora glovebox - it's like moving from a bedsit to a 5 bed detached! Bibs - where's that cupholder? is that on the 'luxury' SC? ha - yes, that's always fun...i had the same on Sunday when changing to BST....all i wanted to do was change the hour +1....but then the minutes started racing around....so get that corrected then go through the perfectly timed pushes to get back to the hours without changing anything else...it's like some kind of puzzle to test your patience. Does the Alpine unit actually talk? yes Beady - that's possible - with a bit of messing i had it set up nicely a while ago - voice guidance off, but on screen guidance working fine - and pushing the * button along the bottom (i think officially the option button) i could switch between IPOD screen or Nav screen... doesn't seem to be quite the same after a trip to the factory but haven't really spent much time trying to get it back to the way it was. there is nothing more annoying than the woman (i guess that applies to voice guidance and/or passenger) butting in 5 times as you approach a roundabout - kind of ruins the tunes.. so - keep trying! here's mine... SCCTC12259HN40868 Launch Edition + Sports Exhaust Storm Titanium Oyster interior Stealth Grey Cast Wheels Twickenham, Middlesex, UK does anyone know what the meaning of the 5 is rather than 7 in the other cars? Silly question - is 122 the lotus type number? If so, wonder what 123 is as we know what 124 is..
Hi Sjrnorel - sports exhaust does make you grin a bit more doesn't it.... I'm sure there's a sub woofer in the back on the drivers side - but i agree it needs 2 more chunky speakers in the back somewhere for a stronger sound.. Have you used your IPOD on another car stereo system? You might need to download something onto your IPOD to ensure it's recognised by the Alpine unit. I have to say that i've not had any of the problems others have listed...other than some damp inside early one - but Lotus had told me that I would need new door seals when i collected the car - and since having that done when i had the sports exhaust fitted it's been fine - in fact it only happened once with the old seals. My car lives outside so is exposed to everything. Al - do your door seals have cuts in them anywhere along the length of them? I think early seals had to be cut to fit properly but the new ones are effectively a sealed seal (if that makes sense). 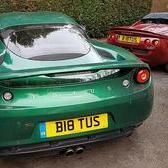 Bingoking - all i can say is i wish i had the chance to use mine as a daily driver - i really think i'm happier when driving the Evora than I was when I had my Elise! ha - Neil's already had the dipping reversing mirrors feedback/suggestion from me a few weeks ago !!! so that's 2 of us - must go through as a vital improvement now....i also suggested parking assist like I have on my family Lexus tank...but i don't think that will be on the cards. Neil is excellent, very responsive, helpful and a pleasure to deal with. Al - in my 20's i used to do a lot of work on my cars...MG Midget / MG BGT (they needed a lot of work as you can imagine, including putting a new full exhaust&manifold onto the BGT) - but nowadays i don't have time or inclination really to endure the red raw hands / scrapes / cuts and frustration...maybe different if i had a nice warm garage (or even a garage would be nice) but then i'd rather fiddle with a classic car than a new one. The kit seems to be the smaller silencer box and fairly short length of pipes - i guess probably joining onto the downpipe of the manifold (i.e. manifold isn't replaced). I'm not sure what the monifold looks like - i.e. if the 2 cylinder banks join into 1 pipe which attaches to this bit of exhaust or if there are 2 joins - I'll try and have a closer look but it's quite hard to see. As to fitting - it was done at Lotus - it was the first one they had fitted and they had a few niggles but no real problems. Lotus sport didn't develop the exhaust - it was done by the Evora team so I think just a bit of a learning curve for them. I was also having new door seals fitted so it was with them for about 3 hours in total...and i got a pretty good deal on labour costs for the exhaust - as you say, adding 2 hours labour onto an already quite expensive item is probably a deal killer... finding info on the exhaust is pretty difficult - i got these pictures from a japanese website !! I don't think i've spent more than 5 minutes in 6th gear since i've had the car...probably something to do with coming from an Elise where you're always up around 4/5000 revs...feels unnatural to me to be doing 2000revs - no drama...no noise. Probably explains why i was prepared to spend money on the sports exhaust - which i do think is overpriced...but i want to enjoy every minute in the car and a bit of extra noise makes me smile a bit more ! My favourite gear on the standard box has to be 2nd...although i quite like 3rd also....4th for when i want to listen to the IPOD or radio on the motorway....5th for when my left hand is getting bored of holding the steering wheel on the motorway and as i've said...i've not found a use for 6th yet...i guess on an unrestricted autobahn it could come in handy.. Drove up to the factory today (short 250 mile round trip...) to have the sports exhaust fitted... It sounds great - and not intrusive at cruising revs on the motorway. I think pedestrians probably get the best deal...i suddenly took a liking to driving with the window down - really makes a big difference in the noise accelerating from a standstill - you hear the exhaust's new (more noisy) sporty note then the usual engine sound from 4000rpm kicks in and it all adds a new sense of urgency that you will want to keep repeating ! Visually...the tailpipes have a sort of bluish tinge and you can see the silencer box is shorter so it has kind of brackets going to the anchor points at the edge towards the wheels where probably before there was more silencer - not a very good description sorry - it just looks different. It's also around 5kg lighter i believe. Anyway, i'm pleased with it - good to be a bit different.... What's next...? Anything else out there Bibs for me to blow the kids school funds on?